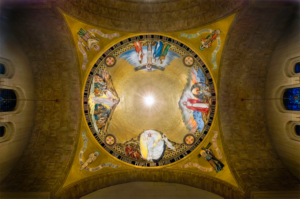 Although each dome is radically different, the installation of the Trinity Dome will unify all five into a coherent storyline ending with the Christ in Majesty mosaic on the North apse wall. Upon looking closely at the theme of each dome, it becomes apparent that they form a timeline of the New Testament. 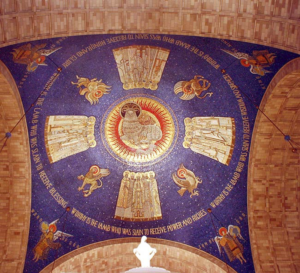 First, the Incarnation Dome depicts the moment at which Christ entered this world and was made manifest. The Redemption Dome depicts the story of how Christ redeemed us through his death and resurrection. 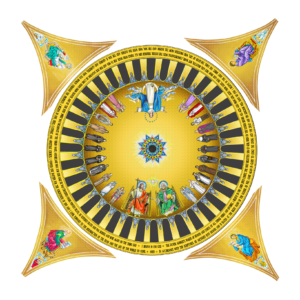 The Trinity Dome encompasses the great mystery of our faith, the Most Holy Trinity, with the Blessed Virgin Mary, angels and saints, encircled by the Nicene Creed. The Sanctification Dome portrays the Descent of the Holy Spirit, when the apostles were given the grace and courage to go out and preach the Gospel to the ends of the earth. The Glorification Dome depicts the prophecies of the end times, the Triumph of the Lamb. This dome naturally leads to Christ in Majesty, the mosaic of Christ in all his glory as he will appear at the end of our world. Thus, the Trinity Dome will not only be the beautiful “Crowning Jewel” but will also complete the biblical timeline which the domes collectively create. The dome was dedicated on November 17, 2007. The mosaic spans 3,780 square feet. 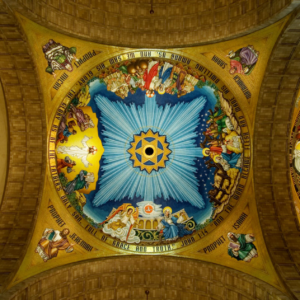 The dome divides into four quadrants which depict the Annunciation, the Nativity, the Wedding Feast at Cana, and the Transfiguration. Its four pendentives portray significant persons from the scriptural and prophetic accounts of these events: Jeremiah, Isaiah, the Matriarch Sarah, and the Prophet Michah. 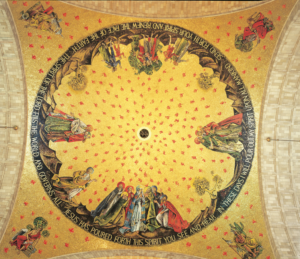 The dome’s mosaic was designed by Leandro Miguel Velasco of Rambusch Decorating Co., the same company which recently designed the Trinity Dome. Travisanutto Co., from Spilimbergo Italy, manufactured the dome. They are currently involved in manufacturing the Trinity Dome. The dome was dedicated on November 16, 2006. It is the exact size of the Incarnation dome. Like its sibling dome, the mosaic splits into four quadrants, which depict four redemptive acts of Christ: the Temptation in the Desert, the Crucifixion, the Descent into Hell and the Resurrection from the Dead. The four pendentives portray significant persons from these biblical accounts: Lazarus, Simon of Cyrene, Joseph of Arimathea, and Mary Magdalene. The Incarnation and the Redemption Domes have similar style, due to the fact that they are both designed by Leandro Miguel Velasco of Rambusch Decorating Co. and manufactured by the Travisanutto Co. The Trinity Dome will follow suit. December 8, 2017, is the projected dedication date. The Trinity Dome is the central and largest dome of the National Shrine, covering 18,300 square feet. 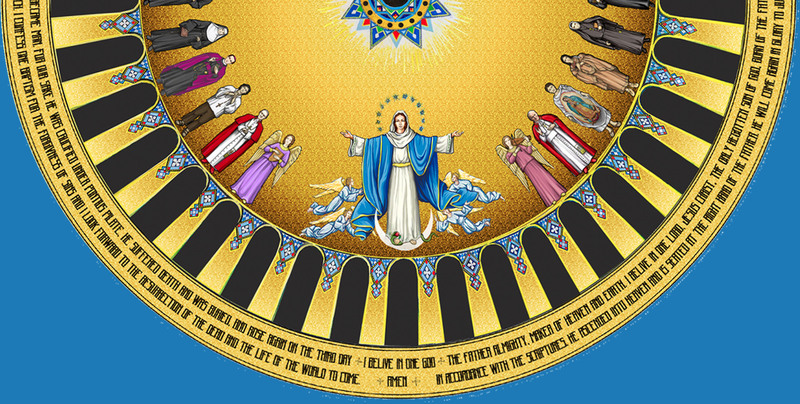 The dome will depict the Most Holy Trinity, the Blessed Virgin Mary as the Immaculate Conception, and a procession of saints who have an association with the United States and the National Shrine. The four pendentives portray the four Evangelists: Matthew, Mark, Luke and John. The base of the dome is encircled with the Nicene Creed. The style of the dome will be somewhat like that of its 2006 and 2007 predecessors, since it is designed and manufactured by the same companies: Rambusch Decorating Co. and the Travisanutto Co. The dome was dedicated in the year 1968. It portrays the famous scene of the Pentecost event, the Descent of the Holy Spirit, using bold reds and golds. The mosaic covers 3,950 square feet and is made up of over 1.25 million pieces of glass. The four pendentives display people from Africa, Asia, Europe and America. They symbolize the sanctification of the world by the Holy Spirit. The dome has a different style than the first three, as it was designed by Max Ingrand, a famous glass worker based out of Paris, France. Ravenna Mosaic Co., based in Missouri and New York, manufactured the piece. The dome was dedicated in the year 1966. The mosaic covers 3,340 square feet. It portrays the apocalyptic theme featuring the lamb with seven horns and seven eyes at the center and an open scroll at its feet. Twenty-four elders dressed in white and wearing gold crowns form the image of a Greek cross. They are separated by four living creatures: a lion, an eagle, an ox and a man. Each of the four pendentives depicts an angel holding a quarter of the earth, illustrating the Kingship of Christ. Instead of wrapping around the base of the dome like the others, the message of this dome splits into each of the four quadrants. Each one contains a statement from the hymn of the elders, the living creatures, and the myriad of angels. Although designed by a different person than the Sanctification Dome, Millard Owen Sheets, the mosaic manufacturer remained the same, Ravenna Mosaic Co. Thus, these two domes possess artistic similarity.